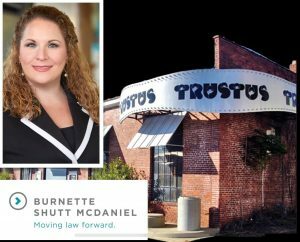 Burnette Shutt & McDaniel attorney Janet E. Rhodes has joined the Board of Directors of Columbia’s Trustus Theatre. Trustus is an award-winning professional theater troupe that produces original and adapted works by local and national artists. Rhodes brings to the board both legal knowledge and lifelong involvement with the arts. The company has grown from its humble roots in an old warehouse in the Vista District. It’s now a half-million-dollar non-profit organization that performs in two venues. Trustus also offers an apprentice company for high school students as well as free clinics that help performers prepare for auditions. Its current 10-play season includes parodies, contemporary pieces and classics. The next Trustus production, “Cost of Living,” will run from Feb. 22 to March 2. The play was the 2018 Pulitzer Prize winner for Drama. Flex Passes still are available for the current season. Rhodes focuses her legal practice at Burnette Shutt & McDaniel on employment law. She’s an experienced litigator and partner at the firm. Rhodes represents clients in federal and state court on issues such as discrimination, equal pay, wage disputes wrongful termination and more. Her work includes matters involving the Americans with Disabilities Act (ADA), the Family Medical Leave Act (FMLA) and the Fair Labor Standards Act (FLSA). She chairs the South Carolina Bar Employment and Labor Law Section’s EEO Committee. A talented vocalist, Rhodes performed with three musical ensembles as a student at Wofford College. She was member of the Sandlapper Singers, South Carolina’s premiere choral music group, for several seasons. She’s also served on arts-related and other boards previously. Rhodes was on the planning committee for the Midlands Arts Conservatory while the charter school, which opened this fall, was in development. She was also on the planning committee for Sherwood Forest SC, a non-profit that dedicates itself to a range of community causes.